In this issue – Volume 6, Number 1 – you’ll find a special feature on Ava DuVernay, titled “Ava DuVernay in conversation with Michael T. Martin — ‘A Call to Action’: Organizing Principles of an Activist Cinematic Practice” – a feature drawn from conversations held during Ms DuVernay’s 2013 visit to the Black Film Center/Archive & IU Cinema. Also in the current issue is a close-up on post-colonial filmmaking in French-speaking countries, with guest editor Delphine Letort. The feature includes articles by Benjamin Stora, Isabelle Vandershelden, Forence Martin, Tsitsi Jaji, Jeanne Garane, and Letort herself. Additionally, you’ll find a feature on cinema as “political activism,” with focus on Ivan Dixon’s 1973 adaptation of Sam Greenlee’s incendiary novel “The Spook Who Sat by the Door;” also, Charles Burnett’s “My Brother’s Wedding” is observed as a “bridge between ‘Killer of Sheep’ and ‘To Sleep With Anger’;” Women on the Algerian Art Scene get a close-up; and more. 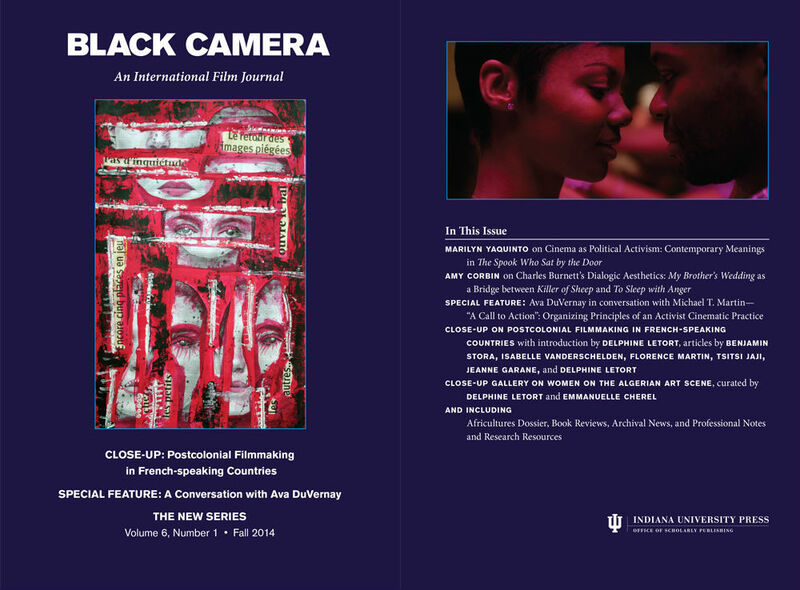 The latest issue of Black Camera: An International Film Journal – a product of the Indiana University Press – is now available in print and online, via JSTOR.